Heather Robinson is a yoga therapist, mentor, teacher and teacher trainer, trained in the teachings of T. Krishnamacharya and T.K.V. Desikachar. She specialises in one to one teaching, therapy work, and teacher development. Her aim is to help bring life and lightness to the use of yoga for self-help and self-development. Heather began teaching yoga in the 1990s in the UK with ‘British Wheel of Yoga’ Teacher & ‘Viniyoga Practitioner’ qualifications. Training in Europe and India in early 2000s led to Yoga Teacher Trainer status. She trained yoga teachers in the UK, and presented a broad range of yoga workshops. Her Yoga Therapist qualification included internships at the Krishnamacharya Yoga Mandiram, Chennai. She has experience with a range of conditions and has taught those living with cancer in a hospital and complementary setting. 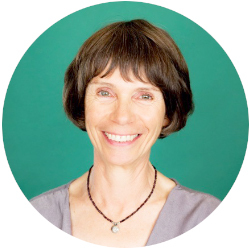 She has been an active member of the British Council for Yoga Therapy (BCYT), developing a core curriculum for yoga therapy, and was a Yoga Profession Specific Board Member 2010/13 for the UK Complementary and Natural Healthcare Council. Heather is a member of Yoga New Zealand and over the last year has acted on a voluntary basis as Yoga New Zealand’s coordinator.